A white male of 17 year old is under arrest after being acused of vandalizing a Hindu temple in Louisville, Kentucky, few days back. He is believed to have acted alone and is now arrested with 1st-degree criminal mischief and 3rd degree burglary. 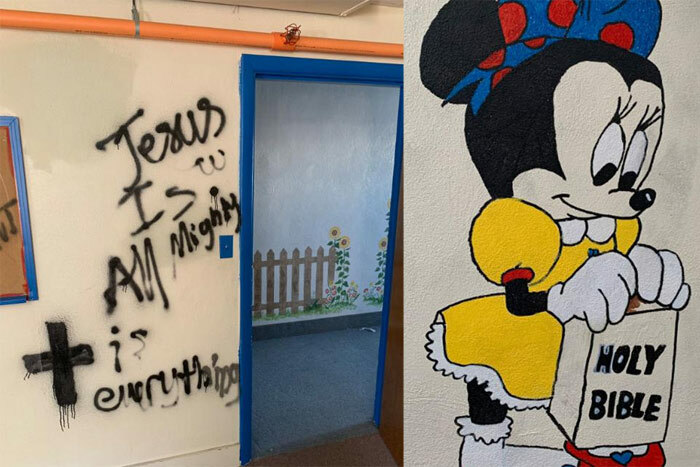 The suspect is accused of vandalizing the temple with spray-painted crosses and religious phrases. He reportedly broke in at Swaminarayan Temple and the temple members found their place desecrated with hate-filled religious phrases and black crosses. Also a knife stab into a chair and several broken doors have been reported in this incident. Louisville Metro Police Chief assured additional security to devotees this coming Sunday, to make them feel safe. Temple spokesperson Rajesh patel said the temple members were shaken by this vandalism incident when they saw the poster of a deity covered with paint. This is reportedly the first incident of its nature for the Hindu community in Louisville. The temple spokesperson says this wasn't an attack by a religion, but an attack by an individual. Several state and local officials condemned this hate act and also expressed their sadness on social media.